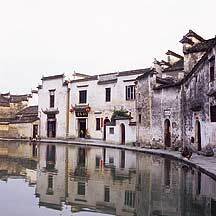 The creation of the waterways and the 月沼Yuezhao (Crescent lake), located on the center of the village, was largely the work of one woman, 胡重Hu Chong 1379 - 1454). A native of another famous 黟县Yixian Village 西递Xidi and the third daughter of a well-known fengshui master, she came to Hongcun as the wife of 思齐公Si Qigong (1374 - 1424), a 76-generation Wang. Her very socially conscious husband was often away on official duty, and the last was away for twenty years. He died a year later after his return. But before his death at 50, he had accomplished a few things. 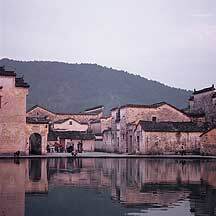 In his early years, he had succeeded getting a very well-known feng shui master to visit and examine Hongcun's landscape; a particular concern that he wanted to consult with was his desire to build the first ancestral shrine in the heart of the village, but after looking over the Wang family records, the location also coincide with his grandfather's chosen spot for a pool. At the same spot was also a small spring. Si Qigong could not decide. 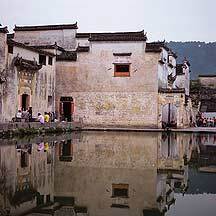 The feng shui master measured the area and gave him his advice: dig the pool right on the eye of the spring as the previous feng shui master had adviced; convey water from the 西溪Xixi (West Stream) into the village and into the pool; and build the ancestral shrine on the edge facing the pool. After this, he convinced the village members the need for the canals and the Crescent Lake. 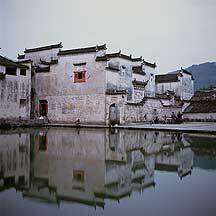 But the very important duty of adminstrating, engineering and executing the difficult works falled on Madame Hu, whose ability had convinced her husband to leave all responsiblity to her. 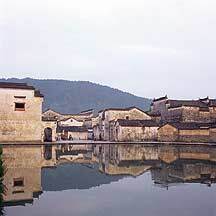 In the twenty years while her husband was away and another 30 years after his death, she had not only singly reared three children, but also had shown her exceptional skill as an engineer, architect, and a feng shui master by successfully designed, engineered, and directed the villagers into completion the waterways network, the Crescent lake, the ancestral shrine 乐叙堂Lexutang, the village's waterwheel, the water controls on the section of the 西溪Xixi (West Stream) where the water enters the village, and later left plans for the creation of 南湖Nanhu (South Lake). Late in the day, villagers often wash by the lake. 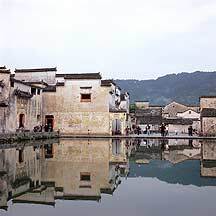 Late in the day, villagers would sit on the straight side of the lake. Late evening. More washing. There is a small square close to the pool where people sit and eat dinner. The buildings around this pool are the best, I think. 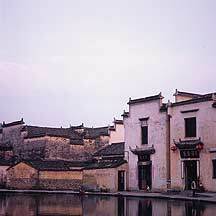 The distinctive white 马头墙 horsehead wall of Hui architecture is shown prominently here. You follow the maze of canals throught the alleys into the village, and then you step into this large space; children are running around, a line of people circling the edge of the pool washing, on stone benches people chat quietly and round a table near the water a family is having their meal under the moonlight. When late light shines down on here, it is magical. As the evening gets closer to night, people disappear. The moon hangs above and shifts slightly on the still pool. A low hum sometimes echo around the building walls, which is now a subdued cyan. One or two cats would unexpectedly appear beside me, staring at the starless heaven. Now, Crescent lake is a dull mirror with a lidless eye. It is utterly otherworldly. You live to a good old age the more you do. After wandering through the labyrinth, you come to the heart of the whole thing and take a picture of yourself, or at least look at your reflection on the pool. The arched doorway is common here which blends in nicely in this area. Isn't it nice to have such a big sink. It is nice to have a few large stones around as seats. It will be around when the next caveman comes back. You know, the old woman always seems to be here. The cats love this pool. This one moves toward the waters with calculated steps and froze on its edges. She got nothing. The tour guides, in yellow shirts, are usually only available for groups, but I got one just for myself. She has been talking about the village and its details for so long, I think, that when she pointed and talked about something to me, she was doing so with her eyes closed. Like 西递 Xidi, swarms of student artists comes to this place. I was told by one resident here that at one day there was a thousand students scratching here. These are university students from big cities such as Z杭州 Hangzhou, 南京 Nanjing and 北京 Beijing. This area is the small square on the east side of the lake.